Our biggest and best Christmas hamper featuring the most highly praised Scottish foods in our collection plus our finest wine, port, whisky and liqueurs. Discover amongst the smoked meats, cheeses and salmon, handmade chocolates, the finest haggis, hearty soups, Scottish baking and festive nibbles, Classic French Macon Lugny, Taylors Late Bottled Vintage Port, Glenmorangie 10yr old single malt, Drambuie and awatd winning Edinburgh Gin. There is even a bottle of Moet and Chandon. After all, what is Christmas without sparkle. Everything about this hamper says elegance, sophistication and good taste. 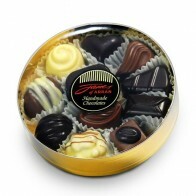 A perfect gift to share with large groups and extended family. 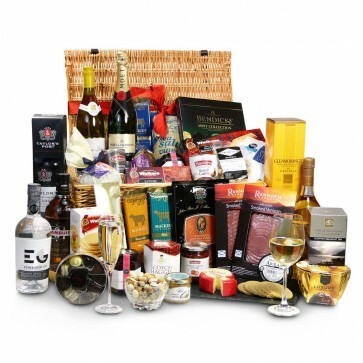 The Inverness Hamper is carefully packed by hand in an elegant wicker hamper with a hand-tied ribbon. Remember to tell us what you'd like written on the personalised gift card included inside.